The development of BEDTools was motivated by a need for fast, flexible tools with which to compare large sets of genomic features. Answering fundamental research questions with existing tools was either too slow or required modifications to the way they reported or computed their results. We were aware of the utilities on the UCSC Genome Browser and Galaxy websites, as well as the elegant tools available as part of Jim Kent’s monolithic suite of tools (“Kent source”). However, we found that the web-based tools were too cumbersome when working with large datasets generated by current sequencing technologies. Similarly, we found that the Kent source command line tools often required a local installation of the UCSC Genome Browser. These limitations, combined with the fact that we often wanted an extra option here or there that wasn’t available with existing tools, led us to develop our own from scratch. The initial version of BEDTools was publicly released in the spring of 2009. The current version has evolved from our research experiences and those of the scientists using the suite over the last year. The BEDTools suite enables one to answer common questions of genomic data in a fast and reliable manner. The fact that almost all the utilities accept input from “stdin” allows one to “stream / pipe” several commands together to facilitate more complicated analyses. Also, the tools allow fine control over how output is reported. The initial version of BEDTools supported solely 6-column BED files. However, we have subsequently added support for sequence alignments in BAM format, as well as for features in GFF , “blocked” BED format, and VCF format. The tools are quite fast and typically finish in a matter of a few seconds, even for large datasets. This manual seeks to describe the behavior and available functionality for each BEDTool. Usage examples are scattered throughout the text, and formal examples are provided in the last two sections, we hope that this document will give you a sense of the flexibility of the toolkit and the types of analyses that are possible with BEDTools. If you have further questions, please join the BEDTools discussion group, visit the Usage Examples on the Google Code site (usage, advanced usage), or take a look at the nascent “Usage From the Wild” page. BEDTools support a wide range of operations for interrogating and manipulating genomic features. The table below summarizes the tools available in the suite. intersectBed Returns overlaps between two BED/GFF/VCF files. pairToBed Returns overlaps between a paired-end BED file and a regular BED/VCF/GFF file. bamToBed Converts BAM alignments to BED6, BED12, or BEDPE format. bedToBam Converts BED/GFF/VCF features to BAM format. bed12ToBed6 Converts “blocked” BED12 features to discrete BED6 features. bedToIgv Creates IGV batch scripts for taking multiple snapshots from BED/GFF/VCF features. coverageBed Summarizes the depth and breadth of coverage of features in one BED versus features (e.g, windows, exons, etc.) defined in another BED/GFF/VCF file. genomeCoverageBed Creates either a histogram, BEDGRAPH, or a “per base” report of genome coverage. unionBedGraphs Combines multiple BedGraph? files into a single file, allowing coverage/other comparisons between them. annotateBed Annotates one BED/VCF/GFF file with overlaps from many others. groupBy Deprecated. Now in the filo package. overlap Returns the number of bases pairs of overlap b/w two features on the same line. pairToPair Returns overlaps between two paired-end BED files. closestBed Returns the closest feature to each entry in a BED/GFF/VCF file. subtractBed Removes the portion of an interval that is overlapped by another feature. windowBed Returns overlaps between two BED/VCF/GFF files based on a user-defined window. mergeBed Merges overlapping features into a single feature. complementBed Returns all intervals not spanned by the features in a BED/GFF/VCF file. fastaFromBed Creates FASTA sequences based on intervals in a BED/GFF/VCF file. maskFastaFromBed Masks a FASTA file based on BED coordinates. shuffleBed Randomly permutes the locations of a BED file among a genome. slopBed Adjusts each BED entry by a requested number of base pairs. flankBed Creates flanking intervals for each feature in a BED/GFF/VCF file. sortBed Sorts a BED file by chrom, then start position. Other ways as well. linksBed Creates an HTML file of links to the UCSC or a custom browser. Throughout this manual, we will discuss how to use BEDTools to manipulate, compare and ask questions of genome “features”. Genome features can be functional elements (e.g., genes), genetic polymorphisms (e.g. SNPs, INDELs, or structural variants), or other annotations that have been discovered or curated by genome sequencing groups or genome browser groups. In addition, genome features can be custom annotations that an individual lab or researcher defines (e.g., my novel gene or variant). The basic characteristics of a genome feature are the chromosome or scaffold on which the feature “resides”, the base pair on which the feature starts (i.e. the “start”), the base pair on which feature ends (i.e. the “end”), the strand on which the feature exists (i.e. “+” or “-“), and the name of the feature if one is applicable. The two most widely used formats for representing genome features are the BED (Browser Extensible Data) and GFF (General Feature Format) formats. 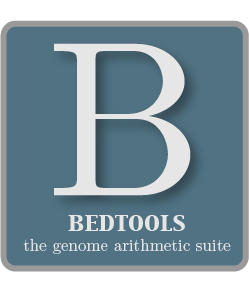 BEDTools was originally written to work exclusively with genome features described using the BED format, but it has been recently extended to seamlessly work with BED, GFF and VCF files. Two genome features (henceforth referred to as “features”) are said to overlap or intersect if they share at least one base in common. In the figure below, Feature A intersects/overlaps Feature B, but it does not intersect/overlap Feature C.
Why, you might ask? The advantage of storing features this way is that when computing the length of a feature, one must simply subtract the start from the end. Were the start position 1-based, the calculation would be (slightly) more complex (i.e. (end-start)+1). Thus, storing BED features this way reduces the computational burden. In contrast, the GFF format uses 1-based coordinates for both the start and the end positions. BEDTools is aware of this and adjusts the positions accordingly. In other words, you don’t need to subtract 1 from the start positions of your GFF features for them to work correctly with BEDTools. The VCF format uses 1-based coordinates. As in GFF, BEDTools is aware of this and adjusts the positions accordingly. In other words, you don’t need to subtract 1 from the start positions of your VCF features for them to work correctly with BEDTools. Whenever a BEDTool compares two files of features, the “B” file is loaded into memory. By contrast, the “A” file is processed line by line and compared with the features from B. Therefore to minimize memory usage, one should set the smaller of the two files as the B file. One salient example is the comparison of aligned sequence reads from a current DNA sequencer to gene annotations. In this case, the aligned sequence file (in BED format) may have tens of millions of features (the sequence alignments), while the gene annotation file will have tens of thousands of features. In this case, it is wise to sets the reads as file A and the genes as file B. By requiring one delimiter type, the processing time is minimized. Tab-delimited files are more amenable to other UNIX utilities. GFF files can contain spaces within attribute columns. This complicates the use of space-delimited files as spaces must therefore be treated specially depending on the context. We have defined a new file format (BEDPE) to concisely describe disjoint genome features, such as structural variations or paired-end sequence alignments. We chose to define a new format because the existing BED block format (i.e. BED12) does not allow inter-chromosomal feature definitions. Moreover, the BED12 format feels rather bloated when one want to describe events with only two blocks. Rather straightforward. If you use the “-h” option with any BEDTool, a full menu of example usage and available options (when applicable) will be reported. BEDTools will typically reject BED features that contain negative positions. In special cases, however, BEDPE positions may be set to -1 to indicate that one or more ends of a BEDPE feature is unaligned. BEDTools will reject BED features where the start position is greater than the end position. BEDTools will process gzipped BED, GFF, VCF and BEDPE files in the same manner as uncompressed files. Gzipped files are auto-detected thanks to a helpful contribution from Gordon Assaf. As of Version 2.8.0, five BEDTools (intersectBed, coverageBed, genomeCoverageBed, bamToBed, and bed12ToBed6) can properly handle “split”/”spliced” BAM alignments (i.e., having an “N” CIGAR operation) and/or “blocked” BED (aka BED12) features. intersectBed, coverageBed, and genomeCoverageBed will optionally handle “split” BAM and/or “blocked” BED by using the -split option. This will cause intersects or coverage to be computed only for the alignment or feature blocks. In contrast, without this option, the intersects/coverage would be computed for the entire “span” of the alignment or feature, regardless of the size of the gaps between each alignment or feature block. For example, imagine you have a RNA-seq read that originates from the junction of two exons that were spliced together in a mRNA. In the genome, these two exons happen to be 30Kb apart. Thus, when the read is aligned to the reference genome, one portion of the read will align to the first exon, while another portion of the read will align ca. 30Kb downstream to the other exon. The corresponding CIGAR string would be something like (assuming a 76bp read): 30M*3000N*46M. In the genome, this alignment “spans” 3076 bp, yet the nucleotides in the sequencing read only align “cover” 76bp. Without the -split option, coverage or overlaps would be reported for the entire 3076bp span of the alignment. However, with the -split option, coverage or overlaps will only be reported for the portions of the read that overlap the exons (i.e. 30bp on one exon, and 46bp on the other). Using the -split option with bamToBed causes “spliced/split” alignments to be reported in BED12 format. Using the -split option with bed12ToBed6 causes “blocked” BED12 features to be reported in BED6 format. When working with a large BAM file using a complex set of tools in a pipe/stream, it is advantageous to pass uncompressed BAM output to each downstream program. This minimizes the amount of time spent compressing and decompressing output from one program to the next. All BEDTools that create BAM output (e.g. intersectBed, windowBed) will now optionally create uncompressed BAM output using the -ubam option. BEDTools was implemented in C++ and makes extensive use of data structures and fundamental algorithms from the Standard Template Library (STL). Many of the core algorithms are based upon the genome binning algorithm described in the original UCSC Genome Browser paper (Kent et al, 2002). The tools have been designed to inherit core data structures from central source files, thus allowing rapid tool development and deployment of improvements and corrections. Support for BAM files is made possible through Derek Barnett’s elegant C++ API called BamTools. As open-source software, BEDTools greatly benefits from contributions made by other developers and users of the tools. We encourage and welcome suggestions, contributions and complaints. This is how software matures, improves and stays on top of the needs of its user community. The Google Code (GC) site maintains a list of individuals who have contributed either source code or useful ideas for improving the tools. In the near future, we hope to maintain a source repository on the GC site in order to facilitate further contributions. We are currently unable to do so because we use Git for version control, which is not yet supported by GC. 1.2 Summary of available tools. 1.3.1 What are genome features and how are they represented? 1.3.2 Overlapping / intersecting features. 1.3.3 Comparing features in file “A” and file “B”. 1.3.4 BED starts are zero-based and BED ends are one-based. 1.3.5 GFF starts and ends are one-based. 1.3.6 VCF coordinates are one-based. 1.3.7 File B is loaded into memory (most of the time). 1.3.8 Feature files must be tab-delimited. 1.3.9 All BEDTools allow features to be “piped” via standard input. 1.3.10 Most BEDTools write their results to standard output. 1.3.11 What is a “genome” file? 1.3.12 Paired-end BED files (BEDPE files). 1.3.13 Use “-h” for help with any BEDTool. 1.3.14 BED features must not contain negative positions. 1.3.15 The start position must be <= to the end position. 1.3.19 Writing uncompressed BAM output. 1.4 Implementation and algorithmic notes.